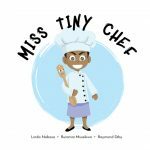 Miss Tiny Chef is only eight years old. She does things other little girls wouldn’t do. Armed with a talking mingling stick that shares all its great recipes with her, Kasini stirs up a special surprise meal for mummy. 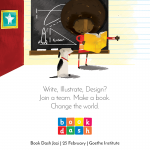 Created at Book Dash Jozi on 25 February 2017 by Linda Nabasa (writer), Raymond Diby (illustrator) and Ruramai Musekiwa (designer). Edited by Nabeela Kalla.